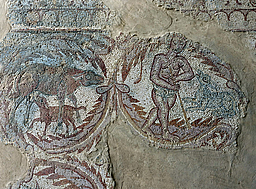 In the western part of the Archaeological Park there are two outstanding cultural heritage sites of Madaba: The mosaics of the Burnt Palace, a Byzantine residence from the end of the 6th / beginning of the 7th century, burnt down probably during the earthquake of 747. 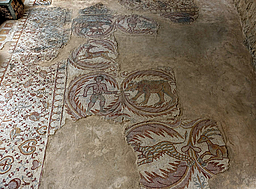 And the Church of the Holy Martyrs, called by the locals Church of al-Khadir, a 6th century basilica with a large mosaic floor. Remains of a luxurious Byzantine residence, with rooms and corridors, porticos and outdoor courtyards, built at the end of the 6th / beginning of the 7th century, most probably for the priest of the nearby Martyrs' Church. 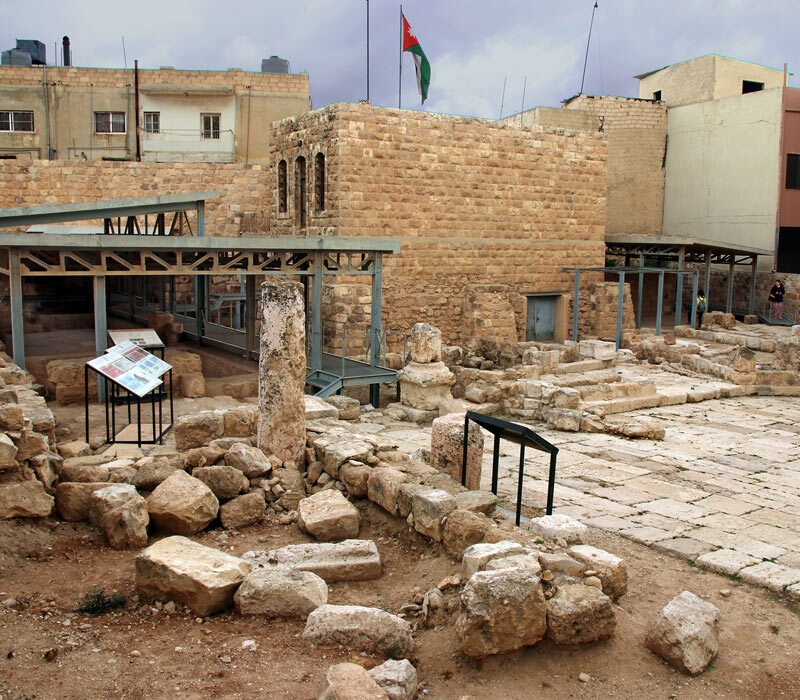 The structure continued to be used throughout the Umayyad period and beyond. Archaeologists found several signs of fire which caused partial damage to the structure. The fire could have been triggered by the earthquake of 747 that resulted in the destruction of the building as well. 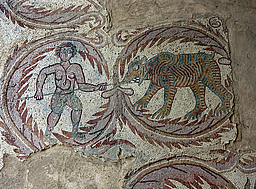 The construction of a modern house towards the turn of the 20th century caused further damage to the site and its mosaics. 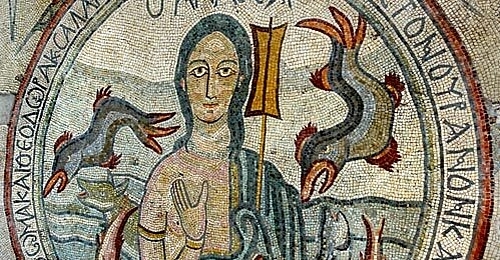 What remains of the mosaics of the Burnt Palace contains remarkable and exquisite examples of Byzantine design. These include geometric patterns of interlacing circles, loops and indented squares, the personification of the season, and the bust of Tyche wearing a turreted crown. 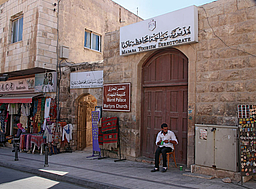 As there are no permanent sources of water in or near Madaba, water was collected and stored in cisterns. In Byzantine times the inhabitants restored and reused the Roman cisterns. 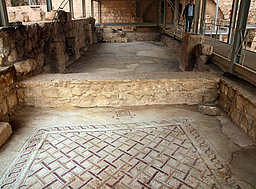 One example is a cistern within the complex of the Burnt Palace. There are also traces of water drainage channels within the premises of this unique residential complex. 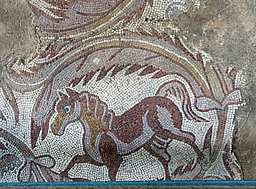 See the mosaics and more details in our photo tour. 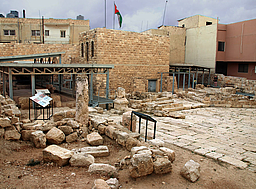 The Church of the Holy Martyrs, known by the local Christians as the Church of al-Khadir, is located on the south side of the paved Roman street. 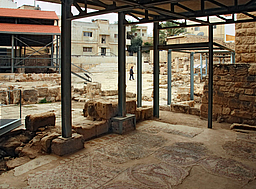 It was excavated by the German Evangelical Institute in 1966, and later on further excavations have been done by other archaeologists. Dated to the 6th century, the basilica of 32 x 16 m had three doors on the facade. The bases and columns, as well as the capitals and the steps of the synthronon [semicircular bench in the apse for the clergy], are re-used from older Roman buildings. Two rows of ten columns and two pilasters each separate the central nave, tapering to the east, from the side naves. The presbyterium, which is two steps higher than the nave and enclosed by a chancel screen, extends into the nave as far as the third pair of columns. 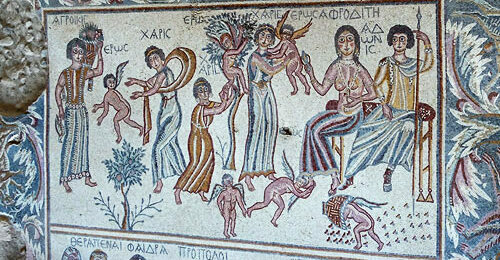 The mosaic had already been damaged in earlier times and suffered further damage during the excavation. 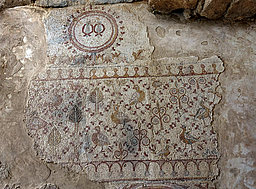 In spite of iconoclastic mutilation of the mosaic floor which was repaired by filling the holes with lime mortar, the decoration is still legible in its general outlines and in many of its motifs. 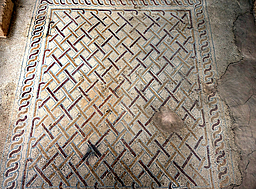 For more information and details see our photo tour.